Party activists are demanding a united front against Supreme Court nominee despite election year pressures. WASHINGTON — Throughout four days of hearings on Brett Kavanaugh’s Supreme Court nomination, Democrats grilled him on a range of issues, disrupted the committee chairman and managed to delay the hearing — but they likely did nothing to derail his path to confirmation. When it was all over, Democrats remained unsatisfied with Kavanaugh’s testimony and the way the hearings were run, vowing to press forward with more questions. Committee members say they will continue to push for the release of hundreds of thousands of documents pertaining to Judge Kavanaugh’s career that have not been released to the senators or the public. But more document disclosures seem unlikely with Republican leadership pushing forward on President Donald Trump's nominee and progressive activists are growing ever more impatient with Senate Democrats, demanding that Senate Minority Leader Chuck Schumer keep his members unified in opposition and calling on him to do more to defeat Kavanaugh. “The Supreme Court is on the line and you’re failing us,” a group of 13 progressive organizations wrote in a letter to Schumer. Progressives are demanding that Schumer enforce party discipline and not allow Democratic senators who face re-election in states where Trump won in 2016, and remains popular, to vote for Kavanaugh's confirmation. "Your strategy to sacrifice the Supreme Court in order to hold Democratic Senate seats is not only strategically and morally wrong, it will fail,” the letter continues. Even if all 49 Senate Democrats vote against the nomination, Kavanaugh will be confirmed unless two of the 51 Republicans join them in dissent. But Democrats could lose ground in their quest to take back control of the Senate if they all stick together. And Schumer is unlikely to attempt any drastic measure to try to enforce complete unity. Three Democrats who face re-election in just weeks in Republican-heavy states voted in favor of Trump's first Supreme Court nominee, Neil Gorsuch. All three — Sens. Joe Manchin of West Virginia, Heidi Heitkamp of North Dakota and Joe Donnelly of Indiana — are in highly competitive races. At the hearing, Democrats presented no damning evidence or testimony that threatened to strip him of any GOP support. 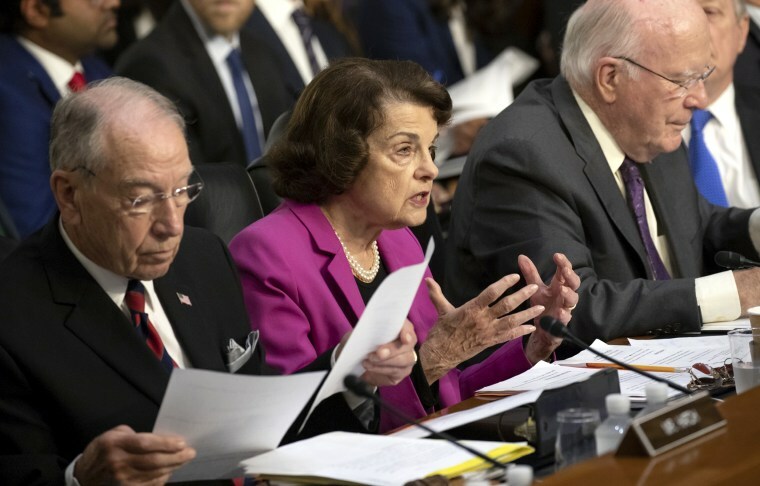 Democrats delayed the hearings’ proceedings by a few hours, protesting the volumes of documents that had been withheld from senators’ and the public’s view pertaining to Kavanaugh’s career as counsel and as staff secretary in President George W. Bush’s White House. They argued that Kavanaugh would overturn Roe v. Wade, side against workers, be too deferential to executive power, and roll back access to health care. In one moment of questioning by Sen. Ted Cruz, R-Texas, Kavanaugh referred to birth control as “abortion-inducing drugs,” causing women’s choice advocates to sound the alarm. Jake Faleschini, director of the Federal Court Program at the Center for American Progress, issued a pointed attack on red state Democrats who are running on issues of health care and Trump, asked how a senator could be “truly pro-choice,” “truly be a check on the president” and “truly claim to have protected their constituents health care” and vote for Kavanaugh. Midterm political concerns are also colliding with future presidential politics, creating more friction within the party. At least three Democrats on the Judiciary Committee are considered potential presidential candidates in 2020: Sens. Amy Klobuchar, D-Minn., Cory Booker, D-N.J., and Kamala Harris, D-Calif.
One of those, Booker caused a firestorm for releasing documents labeled confidential to anyone outside the Senate Judiciary Committee. Senate Majority Leader Mitch McConnell said he’s exploring opening an ethics investigation into Booker. Booker was demanding documents that he said showed a troubling record for Kavanaugh’s on race and affirmative action. But he was also showing activists that he would push Republicans a step further than some of his colleagues. And Harris spent several minutes of her questioning insinuating that Kavanaugh had a conversation with someone in the law firm of Trump’s personal attorney, Kasowitz, Benson and Torres, about special counsel Robert Mueller's Russia investigation. But Harris never detailed what she was referring to and the next day Kavanaugh said he had no "inappropriate" conversations about Mueller. “The one that bothered me the most, and I like Senator Harris, is to insinuate that Judge Kavanaugh did something wrong by talking to some unnamed person at a 300-person law firm,” Sen. Lindsey Graham, R-S.C., said. McConnell says he is on schedule to bring Kavanaugh's confirmation to the Senate for a vote before the end of September.